Hi Everyone! I am so excited to be the June Guest Designer for Paper Smooches! This is my LAST Wednesday this month to share new inspiration using stamps and dies from their June Release! I'm so sad but like they say all good things must come to an end. I have really enjoyed my time spent with Paper Smooches this month. It is always an honor to be able to work with a company I absolutely love and adore and I am so glad I got that opportunity this month. I hope you have enjoyed it just as much. I didn't want this month to end so I decided to make two cards for my final post today. 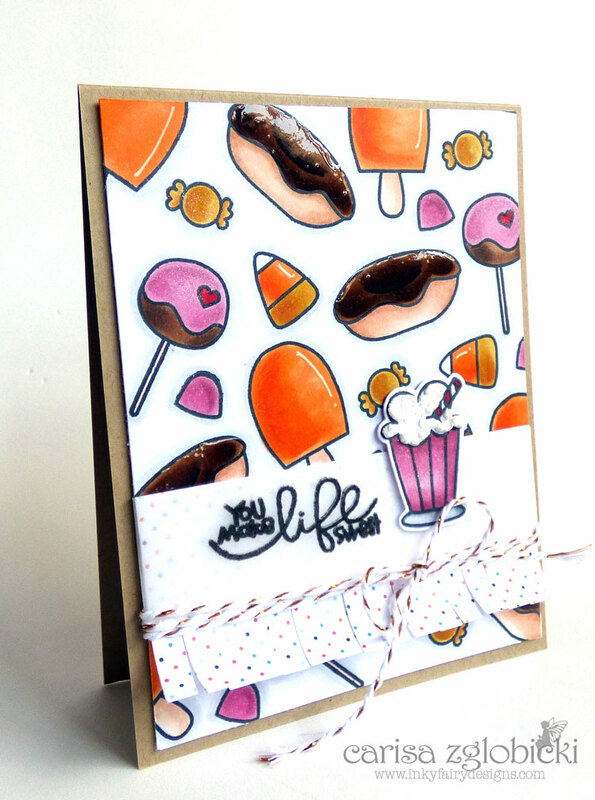 My first card uses the Sugar Rush stamp set with the Sugar Rush Icons Dies. I had this idea to create my own pattern paper with all the different sweets and just took four of the images from the set and placed them on an acrylic block to stamp randomly around the paper. I knew I was going to use my Copic Markers to color so I stamped them in Tsukineko Memento Tuxedo Black ink on Copic Xpress It Blending card. I cut a strip of coordinating pattern paper and used the Fringe 2 Die to create a border for my sentiment. I was extremely happy with my chocolate iced donut - those are my absolute FAVORITE kind of donut and I couldn't resist adding glossy accents on the top. I stamped my sentiment with Tsukineko Versafine Onyx Black ink and used Imagine Crafts Clear Embossing powder to set it. 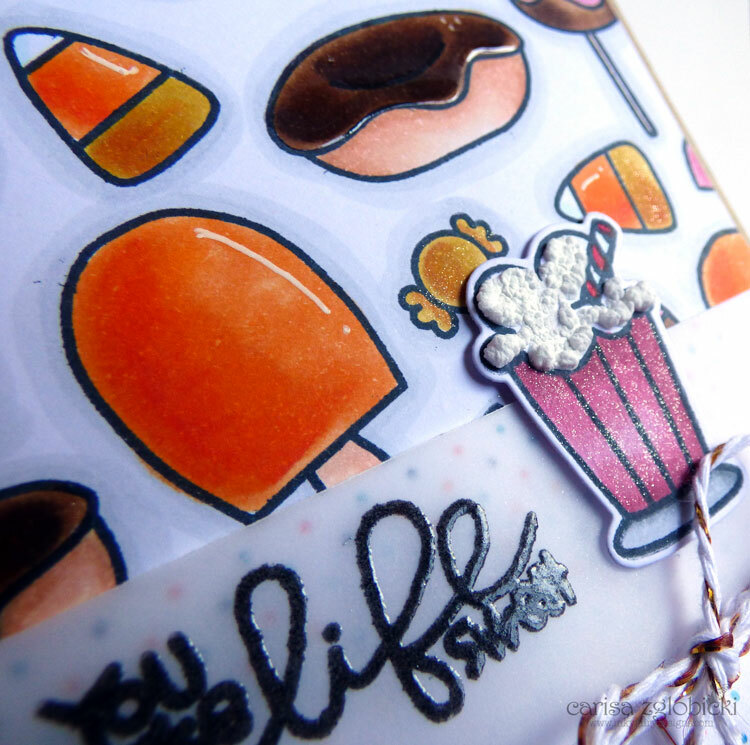 Then I stamped and colored my cream soda and used the Sugar Rush Icons Dies to cut it out. For a little extra pop, I used Zig Wink of Stella Clear and Imagine Crafts Amplify in Neon White. For my second card, I used Gently Seasoned Two. 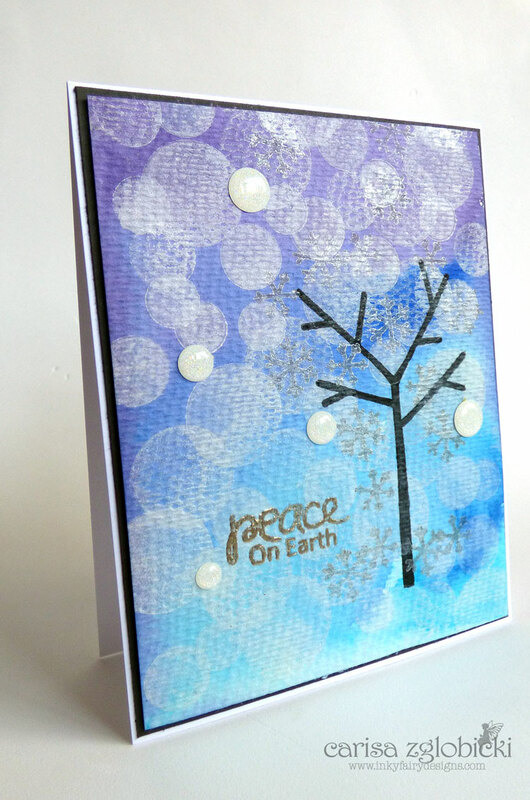 I love this tree that can be decorated for any season but what inspired my card were the circle stamps. I just couldn't wait to create a bokeh effect with those stamps! I decided to get a head start on my Christmas cards and created a wintery background with my Peerless Watercolors and added my sentiment from A Blessed Christmas with Imagine Crafts Silver embossing powder. I'm so happy with how this card turned out! Such a versatile stamp set for sure. The first card is absolutelt adorable and so fun! All those treats look delicious! And, aaah, what a pretty card the second one is. LOVELY job! Congrats on being their Guest Designer for the month! So awesome!! Super cute!! Congrats on the GD gig too!! How super duper fun! I love all the detail you have added to the donut icing and foam in the coffee! I absolutely adore your Sugar Rush card. Super-duper cute! I like the texture you did with the coffee - so cool! Though you're making me hungry for some carbs!! Love it!